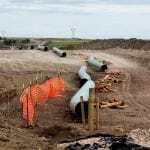 Last Tuesday, President Trump ordered construction of the Dakota Access and Keystone XL pipelines to move forward. In Seattle’s Westlake Park, local tribes and activists gathered to voice their opposition. Listen to what they had to say.